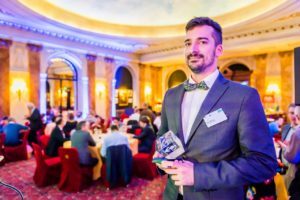 Brussels, 15 November 2018 – Researcher Dr. David Pamies, a Postdoc in the Department of Physiology at Lausanne University, Switzerland was awarded the €100,000 LRI Innovative Science award, one of Europe’s largest research grants for early career scientists, at the award ceremony of Cefic’s 20th Annual Long-Range Initiative (LRI) Workshop in Brussels on November 14, 2018. Dr. Pamies’s winning research proposes a novel approach to identify chemicals that could affect brain development during fetus formation, especially the ones that could later decrease learning and memory capabilities in kids. The project aims to develop a more systematic approach to understand the mechanism of toxic effect (Adverse Outcome Pathways (AOPs)) using a 3D brain model derived from human cells. This research will give us new insights on the effect of chemical exposure during early brain formation and how that can later lead to diseases in kids and adults.